Recent work has demonstrated that the transcription factor, IFN consensus sequence binding protein (ICSBP), plays a critical role in the capacity of mice to control infection with Toxoplasma gondii and Leishmania major, agents that require highly activated macrophages for their elimination. In this report the regulation of ICSBP mRNA and protein were analyzed in murine macrophages stimulated with LPS and/or IFN-γ. Like induction of leishmaniacidal activity, LPS and IFN-γ synergize to induce ICSBP mRNA and protein. Deletion analysis of the ICSBP promoter identified regions that were IFN-γ responsive, regions that mediate the ability of LPS and IFN-γ to activate this promoter synergistically, as well as regions that normally repress ICSBP transcription. Finally, exogenous expression of ICSBP, found in previous studies to down-regulate MHC I gene expression, failed to repress basal or IFN-γ-induced ICSBP transcription. This demonstrates that ICSBP can selectively suppress the expression of IFN-responsive genes. These findings extend in a significant way our understanding of the regulation of ICSBP by LPS and IFN-γ and provide important clues as to its role in macrophage activation. Immune responses are regulated at a variety of levels by cells of the monocyte/macrophage lineage. A complex set of microenvironmental conditions, including cytokines and microbial products, control the dynamic functions of macrophages. These functions include phagocytosis, Ag presentation, cytokine production, and microbicidal and tumoricidal activities (reviewed in Refs. 1 and 2). 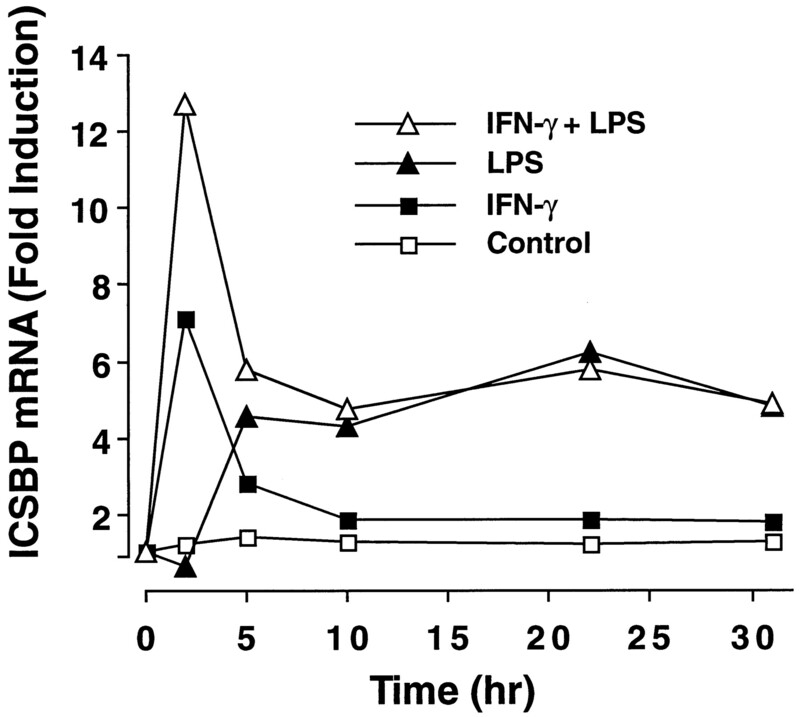 IFN and LPS represent prototype cytokine and bacterial activators of macrophages, respectively (3, 4, 5, 6). Tumoricidal activity is often considered the ultimate state of macrophage activation for which two signals, a priming signal (e.g., IFN-γ) and a trigger signal (e.g., LPS), are required (3). Synergy between IFN-γ and LPS in the stimulation of macrophages has been extended to include the regulation of certain genes (e.g., iNOS) that contribute to the microbicidal and tumoricidal capabilities of these cells (reviewed in 7). The study of genes that are transcriptionally activated by IFN has identified homologous sequences within their promoters that act as cis-acting elements to regulate the expression of these genes. The first sequence of this type was identified by Friedman and Stark (8) and was designated the IFN consensus sequence (ICS).4 It was subsequently established that a sequence within the ICS, termed the IFN-stimulated response element (ISRE), conferred IFN inducibility on a heterologous promoters (reviewed in 9). The ISRE can be bound by members of a growing family of nuclear proteins called IFN regulatory factors (IRFs) (reviewed in 9). There are currently 10 members in this family of related proteins, including IRF-1, IRF-2, the γ subunit of IFN-stimulated gene factor-3 (ISGF3γ), and IFN consensus sequence binding protein (ICSBP). These proteins share significant homology in their N-terminal domains, which allows for interaction with a consensus DNA sequence, (G/C)(A)AAAN2–3AAA(G/C)(T/C), present in the ISRE. There is only limited homology between any of these proteins at their C-terminal ends. Despite the fact that they share DNA binding sites, the IRF family members differ markedly in their abilities to modulate gene transcription (9). For example, IRF-1 plays a role as a positive regulator in the expression of genes such as MHC class I and IFN-β (10, 11, 12, 13). ISGF3γ, the DNA binding subunit of the ISGF3 complex, also acts as a trans-activator (14, 15, 16, 17). In contrast, IRF-2 has generally been associated with negative regulation of gene expression (11), although it was recently shown to up-regulate the expression of certain genes (18). In contrast, ICSBP, whose expression is highly restricted to cells of monocytic and lymphocytic lineages (19), has only been reported to down-regulate the expression of a number of IFN-inducible genes (e.g., MHC class I, 2′,5′-oligoadenylate synthetase, guanylate-binding protein, and ISG-15 genes) (20, 21). The proper balance of IRF family members may be the most important criteria in the control of IFN-regulated gene expression. For example, IRF-1 and IRF-2 compete for the same ISRE, but exert opposing effects on IFN and MHC class I genes (11, 22). ICSBP has been shown to form complexes with IRF-1 or IRF-2 both in vivo and in vitro regardless of the presence of the target DNA. A tighter ICSBP/IRF-2 complex confers more cooperative DNA binding activity on both proteins than that of the ICSBP/IRF-1 complex (23). In addition, the least stable complex, ICSBP/ISGF3γ, inhibits the DNA-binding activity of ISGF3γ (23). Sharf et al. (24) identified three distinct functional domains within ICSBP: a DNA binding domain, a transcriptional repressing domain, and a domain responsible for the association with other IRFs. In addition to its uniqueness as a trans-repressor, and its restricted expression in immune cell types, recent studies using ICSBP knockout mice have revealed the importance of ICSBP in macrophage activation (25, 26, 27). ICSBP knockout mice fail to control infection by Toxoplasma gondii and Leishmania donovani, pathogens that depend on the presence of highly activated macrophages for their elimination. Moreover, these studies revealed that defective production of IL-12 p40 and, as a consequence, limited production of IFN-γ, underlie their sensitivity to these pathogens. Our previous studies demonstrated that IFN-γ, but not IFN-α/β, was a potent inducer of ICSBP mRNA and protein in murine macrophages (28, 29), and that LPS also induces ICSBP mRNA expression, albeit less potently than IFN-γ (30). In this study we sought to analyze the capacity of LPS and IFN-γ to regulate ICSBP transcription in macrophages. Under conditions where we have demonstrated synergistic induction of leishmaniacidal activity in murine macrophages by IFN-γ and LPS (31), the data presented herein demonstrate that ICSBP mRNA and protein are also induced synergistically. Moreover, analysis of the ICSBP promoter was conducted to evaluate the effects of LPS and/or IFN-γ on ICSBP transcription and the potential role of ICSBP in the control of its own expression. C3H/OuJ and C3H/HeJ mice (female, 5–6 wk old) were obtained from The Jackson Laboratory (Bar Harbor, ME). All mice were used within 1 wk of receipt. Mice were maintained in a laminar flow hood in cages fitted with polyester filter hoods and were fed standard lab food and acid water ad libitum. Macrophages were elicited by i.p. injection of 3 ml of sterile fluid thiogycollate medium (3%) and subsequently harvested by peritoneal lavage 4 days after injection. Cells were cultured at 37°C and 6% CO2 in tissue culture petri dishes (100 mm; Falcon, Lincoln Park, NJ) at about 25 × 106 cells/plate in 15 ml of RPMI 1640 (M. A. Bioproducts, Walkersville, MD) supplemented with 2% FCS, 2 mM glutamine, 30 mM HEPES, 0.4% sodium bicarbonate, and penicillin and streptomycin (100 IU/ml and 100 μg/ml, respectively) as described previously (28, 29). RAW 264.7, a mouse macrophage cell line, was purchased from American Type Culture Collection (Manassas, VA). RAW 264.7 cells were cultured in DMEM (Life Technologies, Gaithersburg, MD) supplemented with 5% FBS (HyClone, Logan, UT), 10 mM HEPES, 10 mM glutamine, 100 U/ml penicillin, and 100 μg/ml streptomycin at 37°C and 5% CO2. Protein-free (<0.008%), phenol/water-extracted Escherichia coli K235 LPS was prepared by the method of McIntire et al. (32). Purified, recombinant murine IFN-γ (1.3 × 107 U/mg) was provided by Genentech (South San Francisco, CA). Northern blot analysis was conducted exactly as detailed previously (28). Blots were probed first with [α-32P]dCTP-labeled ICSBP cDNA probe, and subsequently with [α-32P]dCTP-labeled β-actin cDNA probe. The expression of β-actin mRNA was not modulated by any of the treatments used. Following hybridization with 32P-labeled probes, blots were exposed to x-ray film (Kodak X-OMAT AR 5, Eastman Kodak, Rochester, NY) with Kodak X-Omatic intensifying screens. Blots were also exposed to storage phosphor screens (Molecular Dynamics, Sunnyvale, CA) and analyzed using a PhosphorImager (Molecular Dynamics, model 400A) with ImageQuant software (version 3.0). To correct for unequal RNA loading onto gels, the ICSBP mRNA signals for each lane were adjusted relative to its corresponding signal for β-actin. The ratio of ICSBP/β-actin signals was used to calculate fold induction from control treatments. The size of the labeled RNA species was determined by comparing migration distances to RNA standards, which were included in the agarose gel (Life Technologies, Gaithersburg, MD). Nuclear proteins were isolated from macrophages that were lysed under hypotonic conditions with Nonidet P-40 (0.5%) in the presence of protease inhibitors as described previously (29). Western blot analysis for the detection of ICSBP protein was conducted as detailed previously (29). Briefly, equal amounts of protein (5–15 μg) were subjected to SDS-PAGE using the Bio-Rad minigel system (Mini Protean II) and a 12% acrylamide gel. Proteins were transferred electrically to Immobilon-P membranes (Millipore Corp., Bedford, MA). Prestained m.w. markers (Bio-Rad, Richmond, CA) were included in each gel. The membranes were blocked in 5% blocker (Bio-Rad) mixed in Tris-buffered saline for at least 1 h. Detection of ICSBP protein was conducted using the enhanced chemiluminescence (Amersham, Arlington Heights, IL) method according to the manufacturer’s instructions. Hyperimmune anti-ICSBP peptide rabbit serum was diluted 1/800 in blocking buffer and incubated with the membranes for 1 h after blocking. After washing in Tris-buffered saline, the membranes were incubated in a HRP-conjugated secondary Ab (goat anti-rabbit IgG, Bio-Rad), diluted 1/7500 in blocking buffer, for 45 min at 20°C. Membranes were exposed to x-ray film for 0.5–5 min after incubation in HRP substrate. EMSA analysis was performed as we previously described (33). Nuclear extracts were prepared from approximately 1 × 107 RAW 264.7 cells by the method of Schreiber et al. (34). All extracts were stored in aliquots at −70°C, and multiple freeze-thawing cycles were avoided. A portion of the cells was treated with LPS (5 ng/ml) and/or IFN-γ (0.25 U/ml) for 3 h before harvesting. To measure ICSBP DNA-binding activity, a double-stranded 25-bp DNA oligonucleotide (Life Technologies) containing a single copy of the mouse Igκ-chain 3′ enhancer IRF/Ets composite binding site (5′-GAGGAACTGAAAC-3′, the ICSBP binding site is underlined) was used as both probe and competitor DNA. This composite binding site was used instead of an ISRE in these experiments because ICSBP binding to DNA is greatly stabilized in the presence of the transcription factor PU.1, which binds to the upstream GGAA motif (35). PU.1 is constitutively expressed in RAW 264.7 cells, and its DNA-binding activity is not altered by treatment of the cells with either LPS or IFN-γ (data not shown). DNA probes were generated by radiolabeling at the 5′ overhangs with [α-32P]deoxynucleotide triphosphates (DuPont-New England Nuclear, Boston, MA) using E. coli DNA polymerase Klenow fragment (U.S. Biochemical Corp., Cleveland, OH) as recommended by the manufacturer. Unincorporated nucleotides were removed using Sephadex G-25 columns (5 Prime-3 Prime, Boulder, CO). Crude nuclear extracts (typically 2 μg) were incubated with radiolabeled probe DNA (0.1 ng, typically 10,000 cpm) in the presence of 2 μg of poly(dI-dC) (Pharmacia, Piscataway, NJ), 1 mM EDTA, 10 mM Tris-HCl (pH 7.9), 25 mM glycerol, and 0.5 mM DTT in a final volume of 20 μl at room temperature for 30 min as we have previously described (36). In competition experiments, unlabeled DNA was added just before addition of the extract at a 200-fold molar excess. Binding reactions were performed at room temperature for 30 min, then a portion of the mixture (7 μl) was electrophoresed on a 7% nondenaturing, low ionic strength mobility shift polyacrylamide gel using an electrophoresis buffer containing 20 mM Tris-HCl (pH 8.0), 20 mM borate, and 0.5 mM EDTA (0.25× TBE). Gels were dried without fixation and were visualized by autoradiography. The pUE5 (the ICSBP expression plasmid), pLK440 (the empty control vector), pICSBP(351)-CAT and pICSBP(151)-CAT (containing 351 and 151 bp, respectively, of the ICSBP promoter upstream sequences from the transcriptional starting site), and MHC I-CAT construct, pLd-1.4K-CAT reporter plasmids were described in detail in previous studies (20, 37, 38). The C-15 CAT (wild-type) and 5.6 CAT (IRF site mutant, termed C15 m) reporter constructs containing four tandem copies of the composite IRF/Ets binding site derived from the Igκ 3′ enhancer were provided by Dr. Michael Atchison (University of Pennsylvania), and were previously described (39). The control vector pcDNA3.1 was purchased from Invitrogen (Carlsbad, CA) and was used to maintain a constant amount of plasmid DNA in each transfection experiment. The deletion plasmids pICSBP(251)-CAT, pICSBP(236)-CAT, pICSBP(221)-CAT, and pICSBP(179)-CAT, containing 251, 236, 221, and 179 bp of ICSBP promoter upstream sequences, respectively, were cloned using PCR methodology. Briefly, the XbaI-SphI fragment of pICSBP(351)-CAT, which contains the ICSBP promoter, was replaced with one of four PCR-amplified fragments. The sense strand primers used to generate the 5′ ends of each fragment were: AAT TGC ATG CTT TTG GGG CAG CCC CCT (251), AAT TGC ATG CCT CCC CCG CCG CCC CCG (236), GGC TGC ATG CCG GAG TAA AGA GAG AAA (221), and GGC TGC ATG CCA AAA GTG ATT TCT CGG (179). A common 3′ antisense strand primer, ATC CTC TAG ACT GCC CGC GC, was used to generate all four PCR products. The sequences of all constructs were confirmed by sequencing analysis (model 373A DNA Sequencing System, Applied Biosystems, Foster City, CA). RAW 264.7 cells were transfected using either Lipofectamine (Life Technologies) or SuperFect (Qiagen, Valencia, CA). Cells were first seeded in 60-mm tissue culture plates at 3 × 106 cells/plate and incubated at 37°C in 5% CO2 for 18–24 h before transfection. For transfections performed using Lipofectamine, 1 μg of target plasmid was diluted in 300 μl of OPTI-MEM I Reduced Serum Medium (Life Technologies) and then mixed gently with the mixture of 20 μl of Lipofectamine reagent and 300 μl of OPTI-MEM I for 30 min at room temperature to allow DNA-liposome complexes to form. While complexes formed, the cells were rinsed once with OPTI-MEM I. For each transfection, 2.4 ml of OPTI-MEM I was added to the Lipofectamine-DNA mixtures, then overlaid onto the cells and incubated at 37°C in 5% CO2 for 5 h. Following incubation, 3 ml of growth medium containing 10% FBS was added without removing the transfection mixture, then incubated overnight. When cotransfections with both expression and reporter plasmids were conducted, a total of 5 μg of plasmid was added per plate. The total DNA amount was kept constant by adding pLK440 plasmid DNA. The medium was changed, and the cells were treated with the indicated concentration of medium only, LPS alone, IFN-γ alone, or LPS plus IFN-γ for 8 h. For transfections performed using SuperFect, a total of 4 μg of plasmid was used per condition. Cells were transfected according to the manufacturer’s instructions. Following transfection and treatment with LPS and/or IFN-γ, cells were washed with PBS, harvested, and then lysed by freeze-thawing. Lysates were heated at 65°C for 10 min and were assayed for CAT activity by either the method of Gorman et al. (40) or by a two-phase fluor assay as we have previously described (33). The amount of each lysate used in the CAT assays was equilibrated by protein content determined using the Bio-Rad protein assay according to the manufacturer’s instructions. As reported previously (28, 30), we found that either IFN-γ or LPS can stimulate the expression of ICSBP mRNA in C3H/OuJ macrophages; two coordinately regulated mRNA transcripts of 1.7 and 3.0 kb were detected (28, 30). Fig. 1⇓A illustrates that IFN-γ and LPS synergize to induce ICSBP steady state mRNA in these murine macrophages. As reported previously (30), treatment of peritoneal exudate macrophages with 1–10 ng/ml LPS has only a minimal stimulatory effect on the expression of ICSBP mRNA 4 h after treatment. Although a suboptimal concentration of IFN-γ (0.25 U/ml) alone induced a significant level of ICSBP mRNA (∼12-fold induction over basal levels), simultaneous stimulation of macrophages with LPS (1–10 ng/ml) and IFN-γ (0.25 U/ml) was highly synergistic. The inset in Fig. 1⇓A shows the results of a typical Northern blot experiment. 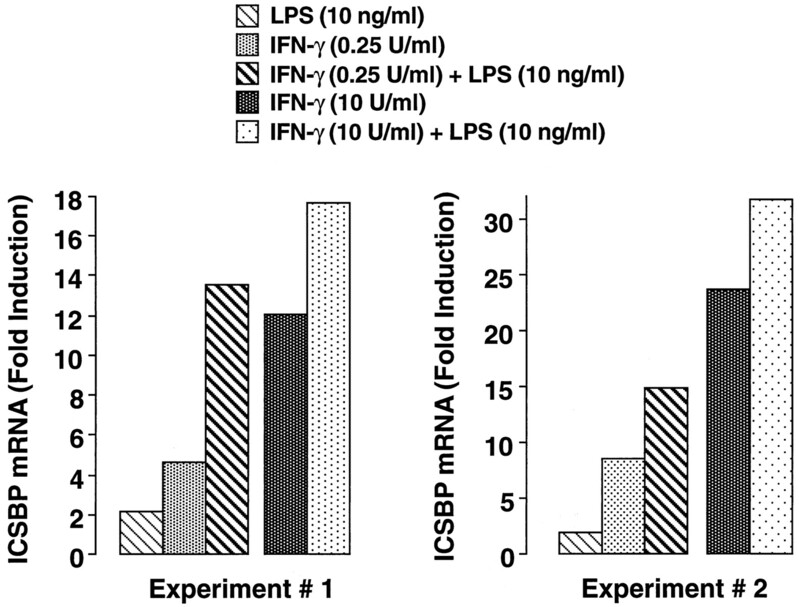 Effect of LPS alone and with IFN-γ on the induction of ICSBP mRNA (A) and protein (B) in mouse peritoneal macrophages. A, Macrophages were treated with varying concentrations of LPS alone (open symbols) or in combination with IFN-γ (0.25 U/ml) for 4 h. Northern analysis (top) was quantified by PhosphorImager analysis by measuring the signal derived from the 3.0-kb ICSBP and β-actin mRNA species for each treatment. A comparison of such ratios to that derived from medium-treated cells is expressed as Fold Induction. Inset, Typical Northern blot showing treatment of macrophages with LPS, IFN-γ, or both. B, Nuclei were isolated from cells treated as described in A after 4 h, and nuclear extracts were analyzed for ICSBP protein by Western analysis. Signals were quantified by scanning densitometry (graph). Inset, Typical Western blot showing treatment of macrophages with LPS, IFN-γ, or both. A and B are each representative of three separate experiments. Previous studies demonstrated that anti-ICSBP peptide antisera detect a protein of ∼53 kDa by Western blot analysis (29). Therefore, experiments analogous to those described above were conducted to evaluate the effects of LPS plus IFN-γ on the induction of ICSBP protein. Because detection of protein by Western blot analysis relies on a nonradioactive signal, densitometric technology was employed to quantify differences in ICSBP protein levels. In untreated macrophages, ICSBP protein was not detectable (i.e., the failure to detect measurable signal in Western blots of cells treated with medium alone precludes the calculation of fold induction). ICSBP expression was readily detected after 4 h of treatment with 10 ng/ml LPS (Fig. 1⇑B). In the absence of LPS, as little as 0.25 U/ml IFN-γ induced levels of ICSBP protein approximately twice as high as those induced by 10 ng/ml LPS alone. As was observed for ICSBP mRNA expression, LPS had a much more dramatic effect on protein levels when present in combination with IFN-γ. A steep dose-response relationship was observed when IFN-γ and LPS (0.1–1 ng/ml) were present concurrently. This synergistic effect was maximal at doses of LPS >1 ng/ml. When present individually, the two stimuli differ in their time course of ICSBP mRNA induction (Fig. 2⇓). 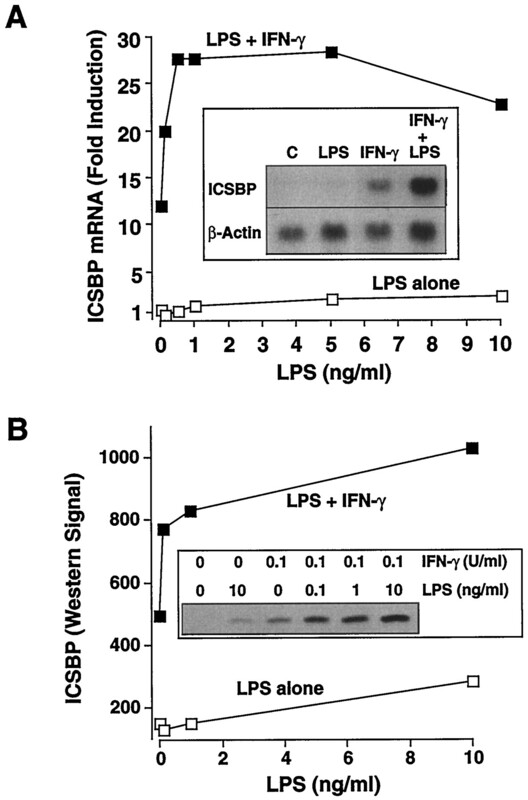 LPS induces ICSBP mRNA expression with somewhat slower kinetics than IFN-γ. In addition, LPS-induced ICSBP mRNA was maintained at high levels for at least 30 h, while induction by IFN-γ was more transient, approaching baseline values approximately 10 h after stimulation. Synergy between IFN-γ and LPS was evident only during the first few hours of treatment, after which mRNA levels declined to levels similar to those induced by LPS alone and remain elevated at the level of cells treated with LPS for 30 h poststimulation. To date, the synergy between IFN-γ and LPS has been shown using suboptimal concentrations of IFN-γ. We also tested for synergistic responses using 10 U/ml IFN-γ, an optimal ICSBP-inducing concentration for murine macrophages (28, 29). Fig. 3⇓ demonstrates that synergy between LPS and IFN-γ was observed even when the latter was present at 10 U/ml. To confirm that LPS is responsible for the observed synergy of ICSBP induction, the effects of combined LPS and IFN-γ treatment were compared in macrophages from the LPS-hyporesponsive (Lpsd) mouse strain, C3H/HeJ, vs the fully LPS-responsive (Lpsn) C3H/OuJ mouse strain. As shown in Fig. 4⇓, LPS-induced effects on ICSBP mRNA induction (either alone or in synergy with IFN-γ) were observed only with macrophages obtained from normally LPS-responsive C3H/OuJ mice and not with those from LPS-hyporesponsive C3H/HeJ mice. Time course of ICSBP mRNA induction in response to LPS, IFN-γ, or both. C3H/OuJ peritoneal macrophages were treated with medium only, IFN-γ (0.25 U/ml), LPS (10 ng/ml), or both simultaneously. Total RNA was analyzed by Northern analysis as described in Fig. 1⇑. LPS synergizes with both suboptimal (0.25 U/ml) and optimal (10 U/ml) concentrations of IFN-γ. Two separate experiments with macrophages treated for 4 h are shown. 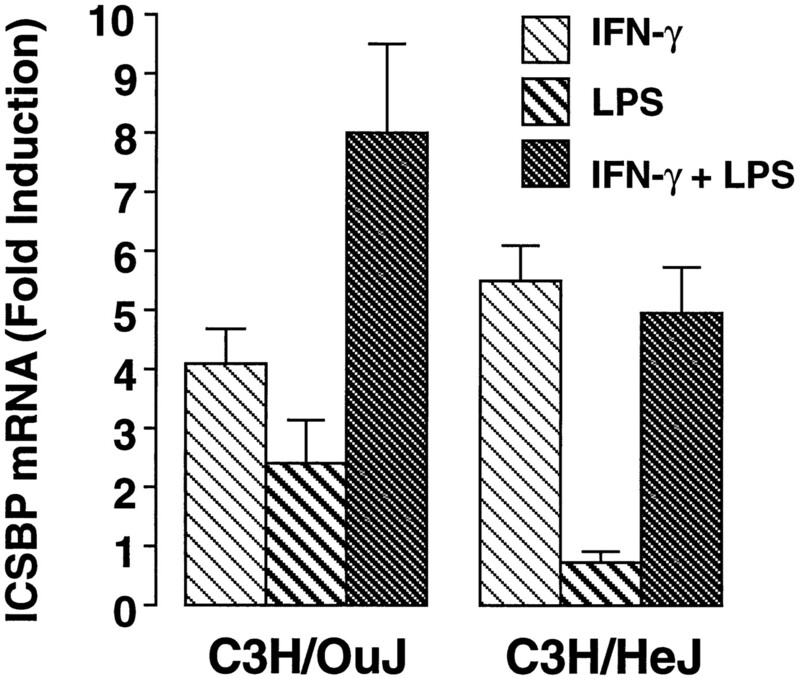 Induction of ICSBP mRNA by LPS with or without IFN-γ in Lpsn (C3H/OuJ) vs Lpsd (C3H/HeJ) macrophages. Peritoneal macrophages from each mouse strain were treated for 4 h with medium only, 0.25 U/ml IFN-γ, 10 ng/ml LPS, or both. Histograms represent the arithmetic mean ± SEM of three (C3H/HeJ) or four (C3H/OuJ) separate experiments. The effect of combined LPS and IFN-γ treatment on the transcriptional capability of the ICSBP promoter was subsequently evaluated. The macrophage cell line RAW 264.7 was transiently transfected with a CAT reporter plasmid under the control of a 351-bp fragment of the ICSBP promoter (ICSBP(351)-CAT), as described previously (37, 38). In preliminary experiments the RAW 264.7 macrophage cell line was found to respond synergistically to LPS plus IFN-γ to produce ICSBP (data not shown). Fig. 5⇓ illustrates that CAT activity was induced by IFN-γ (10 U/ml) alone, but not appreciably by LPS alone (maximum of 50 ng/ml tested). Simultaneous treatment of the transfected cells with LPS and IFN-γ resulted in CAT activity significantly greater than observed with IFN-γ alone. Effect of LPS with or without IFN-γ on the expression of the ICSBP promoter construct, pICSBP(351)-CAT, in murine macrophage cell line RAW 264.7. RAW 264.7 cells were transfected with 1 μg of plasmid by the Lipofectamine transfection method. On the day following transfection, cells were treated with either LPS alone or LPS plus IFN-γ (10 U/ml) for 8 h. Cells were then harvested and extracted, and the levels of CAT activity were measured. The data are derived from a single experiment that is representative of at least three independent experiments. The transcriptional start (cap) site of the murine ICSBP gene was identified in a previous study (38). Sequences upstream from the cap site contained putative TATA and CCAAT box elements at positions −26 and −116 bp, respectively. In addition, additional putative cis elements were identified: GC boxes (positions −35, −49, −227), a palindromic IRE5 (referred to as pIRE, position −155), an IRE-like motif (position −198; see Footnote 5), and an NF-κB site (position −531). To determine the essential cis element(s) that confers maximal basal or inducible levels of ICSBP promoter activity in murine macrophages in transient assays, deletion mutants were constructed from the pICSBP(351)-CAT reporter plasmid that contains the first 351 bp of the ICSBP promoter upstream sequences from the cap site. Each of these mutants contains the TATA box (position −26), two GC boxes (positions −35, −49), and a CCAAT box (position −116) as common cis elements. Additional upstream elements present in the mutant constructs are illustrated in Fig. 6⇓. Detailed structure of the ICSBP promoter construct, pICSBP(351)-CAT, and its deletion plasmids. pICSBP(351)-CAT and pICSBP(151)-CAT were constructed as part of a previous study (37). All other deletion plasmids were derived from pICSBP(351)-CAT by deletion mutation using PCR. The putative cis elements are located as follows: a TATA box (−31 to −26), a CCAAT box (−119 to −116), the GC boxes (−232 to −227, −54 to −49, and −44 to −35), a pIRE (−p175 to −155), an IRE-like motif (−217 to −198), and an NF-κB-like motif (−247 to −238). The ICSBP sequences are shown as dotted blocks, and the CAT reporter gene sequences as solid blocks. To assess basal levels of CAT gene expression induced under the control of the putative ICSBP promoter, pICSBP(351)-CAT, or each of its deletion plasmids (including pICSBP(151)-CAT, that contains only the common cis elements) (37), CAT constructs were transfected into the RAW 264.7 macrophage cell line using Lipofectamine. As shown in Fig. 7⇓A, the putative cis elements upstream from the CCAAT box conferred only slightly higher CAT activity from pICSBP(351)-CAT (4.0%) than those from pICSBP(151)-CAT (2.9%) in the macrophage cell line. Also shown in Fig. 7⇓A, both pICSBP(251)-CAT and pICSBP(236)-CAT gave maximal basal CAT activities (8.2 and 7.9%, respectively) that were consistently observed to be higher than that of pICSBP(151)-CAT (2.9%). Interestingly, the activity of pICSBP(179)-CAT, which contains only the additional pIRE sequence motif upstream of pICSBP(151)-CAT, was somewhat higher (5.9%) than that of pICSBP(151)-CAT (2.9%), pICSBP(221)-CAT (3.0%), and pICSBP(351)-CAT (4.0%). These results suggest that in addition to TATA and CCAAT boxes, the pIRE (position −155) and GC box (position −227) sequences contribute to optimal basal expression of the ICSBP gene. The data also suggest that sequences between positions −351 to −251 and positions −221 to −179 confer an inhibitory effect on basal expression of the ICSBP promoter. Expression of the ICSBP promoter construct, pICSBP(351)-CAT, and its deletion plasmids in RAW 264.7 cells stimulated with LPS with or without IFN-γ. RAW 264.7 cells were transfected with 1 μg of each plasmid by the Lipofectamine transfection method. On the following day, cells were treated with medium only (A) or with IFN-γ (5 U/ml; B), LPS (10 ng/ml; C), or both (D) for 8 h. Cells were then harvested and extracted, and the levels of CAT activity were measured. The percent acetylation is shown on the y-axis. The data are derived from a single experiment that is representative of at least three independent experiments. The additional cis elements contained within each construct are listed in the figure for convenience. Previously, a 4-fold induction of CAT activity was observed in IFN-γ-treated EL-4 cells transiently transfected with pICSBP(351)-CAT, whereas no effect of IFN-γ was observed with the pICSBP(151)-CAT construct (37). Those results suggested that sequences located between positions −151 and −351 were involved in the induction of ICSBP transcription by IFN-γ. The pICSBP(351)-CAT contains several additional cis elements in addition to those contained within pICSBP(151)-CAT, including a palindromic IRE (pIRE), an IRE-like motif (GAAA-containing motif resembling the IRE), a GC box, and an NF-κB-like sequence. To address whether the pIRE alone was sufficient or whether additional upstream sequences were required for IFN-γ induction of ICSBP expression, we tested the effect of IFN-γ on each construct following transfection into RAW 264.7 macrophages. All constructs, except pICSBP(151)-CAT, which lacks the pIRE, showed significant up-regulation, with 2- to 5-fold increases in CAT activity compared with basal levels (Fig. 7⇑, A vs B). Interestingly, pICSBP(179)-CAT, which contains only the pIRE (positions −176 to −156) upstream of the CCAAT box, showed essentially the same level of IFN-γ-inducible CAT activity as that of pICSBP(236)-CAT (Fig. 7⇑B). This result indicates that the ICSBP promoter requires only the pIRE in addition to the TATA and CCAAT boxes for induction of full activity by IFN-γ. In contrast to the induction observed in response to IFN-γ (Fig. 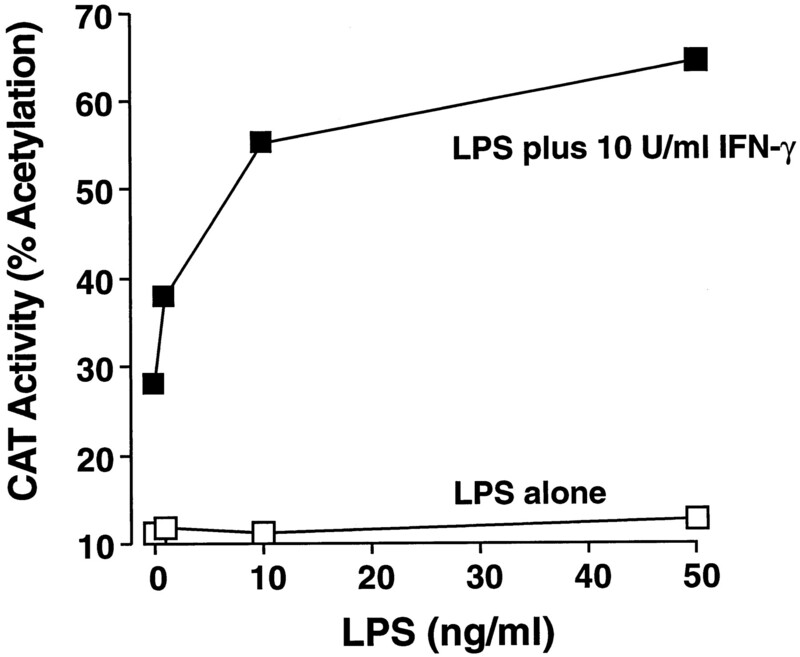 7⇑B), LPS alone failed to induce CAT activity above basal levels in any of the constructs (Fig. 7⇑C). However, when stimulated by combined LPS and IFN-γ treatment, all the constructs except pICSBP(151)-CAT and pICSBP(221)-CAT showed greater CAT activity than when treated with IFN-γ alone (Fig. 7⇑, B vs D). In addition, the CAT activity of pICSBP(179)-CAT was almost the same as that of pICSBP(236)-CAT, which showed the maximally inducible level. This result suggests that even though LPS alone failed to induce expression of ICSBP promoter in the absence of an authentic NF-κB motif, it somehow increased the ability of IFN-γ to induce expression of the ICSBP promoter in RAW 264.7 macrophages. ICSBP has been reported to act as a negative trans-acting factor that suppresses ISRE-containing promoters (20, 21). The ICSBP promoter also contains IFN-responsive elements, the pIRE, and an IRE-like motif (38). In addition, ICSBP is constitutively expressed in cells of the immune system (19, 28). From our results reported above, pICSBP(179)-CAT showed higher basal CAT activity than pICSBP(151)-CAT (Fig. 7⇑A), maximal activity after IFN-γ induction (Fig. 7⇑B), and near-maximal activity upon combined stimulation with IFN-γ plus LPS (Fig. 7⇑D). To determine whether ICSBP itself plays a role in ICSBP gene expression, we cotransfected pICSBP(179)-CAT, pICSBP(221)-CAT, or pICSBP(351)-CAT with an ICSBP expression plasmid (pUE5) or a control plasmid (pLK440). We also determined the effect of ICSBP overexpression on a pMHC I-CAT (an MHC class I promoter linked to the CAT reporter gene). This experiment was performed to confirm the negative regulation of MHC class I promoter activity by ICSBP that had been reported previously (3). As shown in Fig. 8⇓, A and B, ICSBP did not act as a repressor of its own promoter; instead, it acted as a weak trans-activator of all three constructs. In the presence of medium alone (Fig. 8⇓A), constitutive expression of ICSBP by the pUE5 construct resulted in a small, but reproducible, increase in CAT activity above that observed in cells transfected with the control construct pLK440. Upon stimulation with IFN-γ, RAW 264.7 cells transfected with pLK440 exhibited increased CAT activity, which was further augmented by overexpression of ICSBP (Fig. 8⇓B). These results show that unlike its effect on MHC I gene expression, ICSBP not only failed to repress expression of its own promoter, but actually acted as a weak trans-activator, in part through the pIRE motif contained in the pICSBP(179)-CAT construct. Activation of ICSBP promoter by its own protein in RAW 264.7 cells. Cotransfection of pUE5 (ICSBP expression plasmid) or the control plasmid, pLK440, with pICSBP(179)-CAT, pICSBP(221)-CAT, or pICSBP(351)-CAT was conducted in untreated cells (A) or in cells treated with IFN-γ (5 U/ml; B). The pMHC I-CAT plasmid containing the MHC class I promoter was also cotransfected with either pUE5 or pLK440 to confirm the previously reported activity of ICSBP as a negative regulator of MHC class I gene expression. 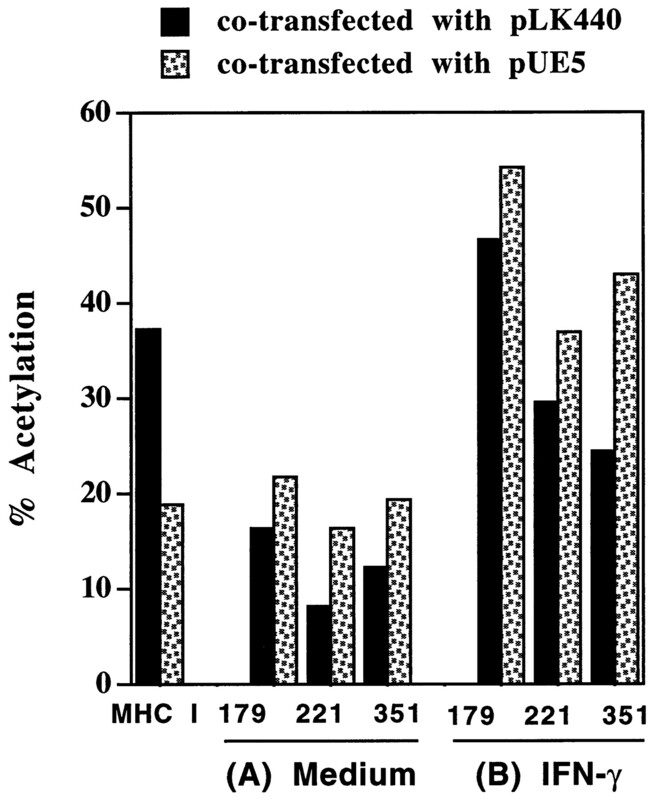 The data are derived from the average percent acetylation of at least three independent experiments. Support for the possibility that ICSBP can function as a positive regulator of transcription in macrophages comes from a recent study of a promoter from the gp91phox phagocyte oxidative burst oxidase catalytic subunit gene. This study demonstrated that the gp91phox promoter contains a functional element that binds ICSBP, IRF-1, and the Ets-like factor PU.1 (41). Sequence analysis of this element revealed that it contained an Ets core sequence adjacent to and upstream of an ISRE half-site. A similar functional element was previously identified in the Ig light chain enhancers and was shown to bind both IRF-4 and PU.1 (39). PU.1 can bind strongly to these composite IRF/Ets elements, although IRF-4 binds to DNA only in the presence of PU.1. Similar findings were later demonstrated using ICSBP and PU.1 (42). Protein-protein interactions between PU.1 and ICSBP or IRF-4 have been found to stabilize binding of the IRF proteins to DNA. We first performed a series of EMSAs to determine whether ICSBP/PU.1 complexes could be formed in RAW 264.7 macrophages, cells that constitutively express PU.1, and that these complexes specifically bound to an IRF/Ets composite site. As shown in Fig. 9⇓A, PU.1 and ICSBP present in macrophage nuclear extracts specifically bound to a DNA probe containing a single copy of the Igκ 3′ enhancer composite site (GGAACTGAAAAC). Abs against PU.1 and ICSBP could supershift the DNA-protein complexes, whereas Abs against IRF-1 and IRF-2 did not supershift the complexes (data not shown). Abs that recognize PU.1 blocked the binding of both PU.1 and ICSBP to the DNA, suggesting that ICSBP could not bind to DNA in the absence of PU.1. Functional interaction of ICSBP with PU.1 on a composite IRF/Ets element. A, EMSA of RAW264.7 nuclear extracts stimulated with LPS (5 ng/ml) and IFN-γ (0.25 U/ml) for 3 h. The EMSA probe used in this experiment contains a single copy of the Ig κ light chain 3′ enhancer IRF/Ets composite sequence (see text for actual sequence). Lane 1, No extract; lane 2, extract alone; lane 3, extract plus anti-ICSBP Ab; lane 4, extract plus anti-PU.1 Ab; lane 5, extracts plus unlabeled competitor DNA containing a single copy of the Ig IRF/Ets composite site; lane 6, extract plus unlabeled competitor DNA containing a single copy of the human IL-1β cap site-proximal PU.1 binding site; lane 7, extract plus normal rabbit serum. Arrows indicate the positions of PU.1/DNA complexes (PU.1), complexes containing both PU.1 and ICSBP (PU.1 + ICSBP), and supershifted complexes (SS). B, ICSBP can augment basal CAT activity of a composite IRF/Ets element. RAW264.7 cells were transiently transfected with a CAT reporter (C15) containing four tandem copies of the Ig κ chain IRF/Ets element or a mutant reporter plasmid (C15m) in which the IRF binding sites within the IRF/Ets elements were mutated. In some cases, cells were cotransfected with an ICSBP expression plasmid. Empty vector DNA was included in each transfection to maintain an equal amount of total DNA in each transfection. A portion of the transfected cells was stimulated 18–24 h after transfection with LPS (5 ng/ml), IFN-γ (0.25 U/ml), or both agents. Mock values represent CAT activity obtained from cells transfected in the presence of empty vector only. All values represent the average of triplicate transfections ± SD. The data presented are representative of at least three separate experiments. We subsequently sought to determine whether LPS and IFN-γ could synergistically activate transcription of a promoter controlled by an IRF/Ets composite element in macrophages. Therefore, the RAW 264.7 macrophage cell line was transiently transfected with a reporter plasmid containing the CAT reporter gene under the control of a herpes simplex virus thymidine kinase promoter ligated downstream of four tandem copies of the Ig enhancer composite element (plasmid designated C15) or composite elements in which the IRF (plasmid designated C15m) binding sites were mutated (GGAACTGAATCA). As shown in Fig. 9⇑B, the C15 reporter plasmid was constitutively expressed in RAW 264.7 macrophages, whereas mutation of the IRF binding sites completely abolished this activity. These data demonstrate that an IRF/Ets composite element can activate transcription in macrophages, and that the IRF binding site is required for this activation. These findings are consistent with data obtained in U937 cells using a reporter gene under the control of the gp91phox IRF/Ets composite element (41). We also sought to determine whether ICSBP could function in conjunction with PU.1 to regulate this promoter. Therefore, RAW 264.7 cells were cotransfected with the C15 or C15m reporter plasmids and an expression plasmid encoding ICSBP. A portion of the transfected cells was exposed to LPS, IFN-γ, or both agents. As shown in Fig. 9⇑B, overexpression of ICSBP resulted in more than a 2-fold enhancement of basal promoter activity. Reporter plasmids in which the IRF binding sites were mutated lacked basal activity and could not be activated by overexpression of ICSBP. Furthermore, treatment of transfected cells with LPS and/or IFN-γ did not significantly affect the expression of the C15 reporter plasmid, even in cells that overexpressed ICSBP. In all cases, the C15 m reporter plasmid was essentially inactive in the transfected macrophages. Together, these data show that ICSBP can function as a transcriptional activator in macrophages through specific interaction with PU.1, but this activation could not be further modulated by LPS and/or IFN-γ. ICSBP is a member of the IRF family that binds to a DNA sequence, known as the ISRE, that mediates IFN responsiveness for many genes. The contribution of ICSBP to regulating macrophage functional capability is unknown. Unlike other IRF family members, ICSBP exhibits tissue specificity, in that it is expressed primarily in cells of the macrophage and lymphocyte lineage. ICSBP mRNA levels become elevated in response to IFN-γ, but not IFN-α/β, in macrophage cell lines (19) and in thioglycollate-elicited peritoneal macrophages (28, 29). Induction of ICSBP production at the protein level has also been demonstrated in murine peritoneal macrophages, and ICSBP has been shown to localize to the nucleus after treatment of cell with IFN-γ (29). ICSBP has been found to be expressed in human cells of the macrophage and lymphoid lineage and to be similarly induced by IFN-γ (21). Functional data using reporter constructs containing IFN-responsive promoters support a role for ICSBP as a negative transcriptional regulator in both mouse (20) and human (21) cells. In addition, recent evidence suggests that ICSBP interacts with IRF-1 and IRF-2 and that this interaction results in the formation of a complex with an increased affinity toward the ISRE compared with ICSBP alone (23). These authors also found that ICSBP has the ability to decrease the binding of ISGF3γ to the ISRE. We have reported here that LPS and IFN-γ synergize to induce ICSBP mRNA, protein, and the formation of ICSBP-DNA complexes in murine macrophages (Figs. 1⇑ and 9⇑A). This synergy is most clearly observed at suboptimal levels of IFN-γ (Fig. 3⇑) and is likely to result from a rapid and transient burst of ICSBP mRNA production, peaking approximately 2 h after stimulation with both LPS and IFN-γ (Fig. 2⇑). The Lpsd-selective defect in LPS signaling, present in macrophages from C3H/HeJ macrophages, blocked the synergistic production of ICSBP mRNA in cells stimulated with both LPS and IFN-γ, but had no effect on IFN-mediated signaling (Fig. 4⇑). Furthermore, synergistic production of ICSBP mRNA was regulated at the transcriptional level, as indicated by the response of a reporter gene under the control of a 351-bp fragment of the ICSBP promoter (Fig. 5⇑). Deletion analysis of the ICSBP promoter identified regions that were IFN-γ responsive, regions that mediate the ability of LPS and IFN-γ to activate this promoter synergistically, as well as regions that normally repress ICSBP transcription (Fig. 7⇑). Finally, exogenous expression of ICSBP, found in previous studies to down-regulate MHC I gene expression, failed to repress basal or IFN-γ-induced ICSBP transcription (Fig. 8⇑). This demonstrates that ICSBP can selectively suppress the expression of IFN-responsive genes. These findings extend in a significant way our understanding of the regulation of ICSBP by LPS and IFN-γ and provide important clues to its role in macrophage activation. Cooperation at the level of gene regulation between IFN-γ and LPS has been demonstrated with several genes, including, TNF-α, iNOS, and IP-10 (43, 44, 45). We observed similar cooperation for ICSBP at the levels of protein and steady state mRNA expression as well as in transient transfection assays using RAW 264.1 cells and the ICSBP-CAT reporter plasmids. The mechanisms by which the induction of any specific gene is induced in a synergistic manner are complex and depend on the presence of various cis-acting elements within the promoter region and their coordinate engagement by DNA binding proteins (46). For example, Gao et al. (7) have recently proposed a model to explain the limited activation of iNOS gene expression when stimulated by LPS vs LPS plus IFN-γ. In their model, IFN-γ generated phosphorylated Stat1α homodimers preferentially, and these engage a GAS element that has been shown previously to be essential for iNOS gene expression (47). IFN-γ can also concurrently elicit the induction of other IRF family members, including IRF-1, which was also shown previously to be essential for the induction of this gene (48, 49). The additional presence of LPS generates additional signaling molecules (e.g., NF-κB and IRF-1) as well as IFN-α/β, which, in turn, acts back on the macrophage to induce additional activated Stat1α (7). In concert with additional, constitutively produced octamer-binding factors, coordinate engagement of these six cis-acting elements results in optimal transcription. A similar model has been proposed by Ohmori et al. (45) for the regulation of IP-10 in murine macrophages. Moreover, it is likely that the IFN-responsive elements within the ICSBP promoter are not shared by LPS-responsive elements. This conclusion comes from studies of Lpsd macrophages, which exhibited normal production of ICSBP mRNA following stimulation with IFN-γ alone and did not exhibit synergistic activation following treatment with both LPS and IFN-γ. 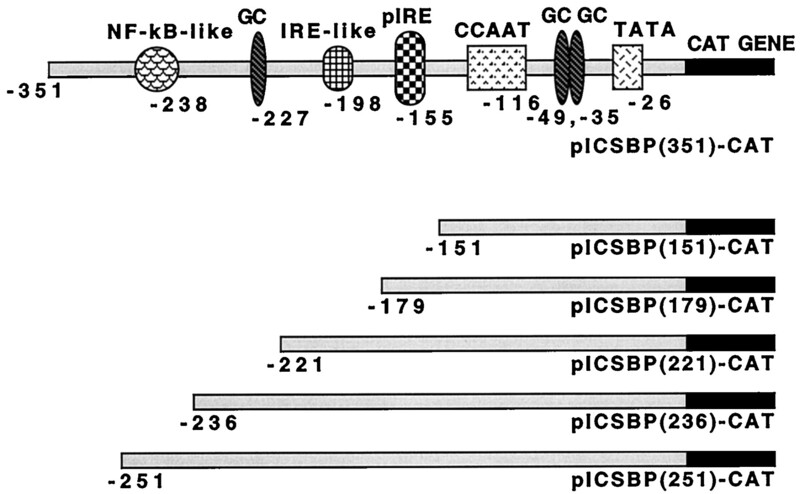 The 5′ regulatory region of the murine ICSBP gene has been characterized (38), and the sequence between positions −175 and −155 identified as an IFN-γ response region, called the pIRE (see Footnote 5). In IFN-γ-activated EL-4 T cells, activation of ICSBP has been associated with activation of Stat1, which has been shown to bind to the pIRE of both IRF-1 and ICSBP promoters (37). GC box and IRE-like sequences were also identified at positions −222 to −227 and −217 to −198, respectively (38). In this study, we generated deletion mutants (Figs. 6⇑ and 7⇑) to explore the contributions of these various cis-acting elements to transcriptional activation of ICSBP by IFN-γ alone, LPS alone, or both activators. In promoter mutants containing only the pIRE (pICSBP(179)-CAT), this element was sufficient to mediate optimal basal and IFN-γ-induced transcription. LPS alone had no stimulatory effect above basal levels. 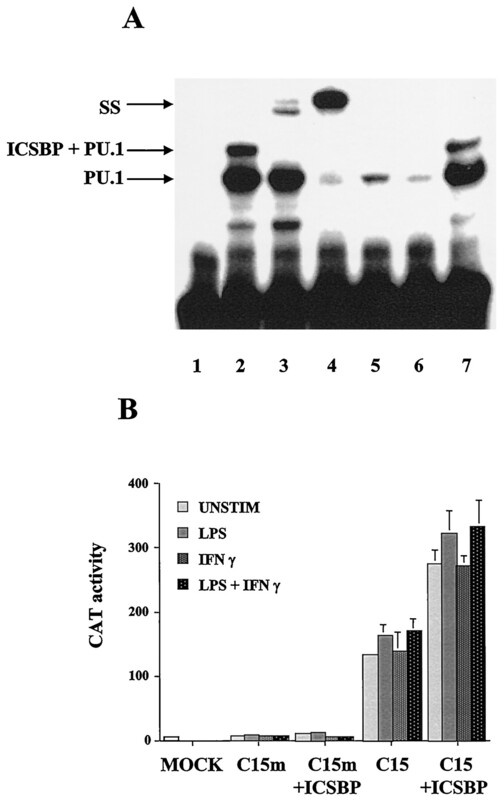 However, the combination of LPS and IFN-γ resulted in significantly increased CAT activity in four of five reporter plasmids. Our data contrast with previous studies conducted in the murine EL-4 T-cell line, where pICSBP(151)-CAT resulted in basal CAT activity somewhat higher than that induced by pICSBP(351)-CAT (37). This suggests that the transcriptional factors involved in basal expression of the ICSBP promoter may differ between T cells and macrophages. The finding that synergy is observed in constructs that lack the NF-κB-like motif (which is present in the pICSBP(351)-CAT construct) suggests that LPS-induced trans-acting factors apart from NF-κB contribute to the synergistic activation of such constructs in the presence of IFN-γ plus LPS. Alternatively, LPS-induced NF-κB may interact directly with other transcription factors via protein-protein interaction without direct binding to DNA. Thus, the absence of an NF-κB binding motif would not affect its ability to contribute to functional synergy via protein-protein interaction. It is interesting to note that the pICSBP(221)-CAT and pICSBP(351)-CAT constructs showed significantly diminished responses compared with the minimal pIRE-containing construct. Thus, engagement of an incomplete repertoire of cis-acting elements can exert an inhibitory effect on transcription. Interestingly, one construct (pICSBP(221)-CAT) failed to exhibit LPS responsiveness in the presence or the absence of IFN-γ, although both shorter (pICSBP(179)-CAT) and longer (pICSBP(236)-CAT) constructs exhibited increased CAT activity in the presence of both LPS and IFN-γ. The molecular basis for this observation remains unclear and is under investigation. Finally, our data show that ICSBP can function in macrophages as a transcriptional activator of its own promoter (Fig. 8⇑), and of a synthetic PU.1-dependent promoter (C15) through specific interaction with an IRF/Ets composite element (Fig. 9⇑). Overexpression of ICSBP protein could further enhance transcription of the ICSBP promoter by LPS and IFN-γ. In contrast, enhanced activity of the C15 promoter by ICSBP could not be further modulated by LPS and/or IFN-γ. Thus, we have shown that transcriptional activity of the ICSBP promoter generally correlates with ICSBP protein levels, although transcription of a promoter regulated by ICSBP/PU.1 complexes did not. Therefore, the ability of LPS and IFN-γ to increase ICSBP protein levels synergistically in macrophages may have a selective effect on different ICSBP-dependent genes. Although stimulation with LPS plus IFN-γ, which induced endogenous ICSBP expression in RAW 264.7 macrophages, does not affect C15 transcription (Fig. 9⇑), overexpression of ICSBP encoded by a transfected plasmid increased C15 transcription approximately 2-fold. This most likely results from the much higher levels of ICSBP protein present in cells transfected with the ICSBP expression plasmid than those in cells stimulated with LPS plus IFN-γ. Moreover, these high ICSBP levels are sustained in the ICSBP transfectants due to the strong CMV promoter in the expression plasmid. In contrast to the observation that endogenous ICSBP mRNA is rapidly, but transiently, expressed in macrophages treated with LPS plus IFN-γ (Fig. 2⇑ and data not shown), much higher levels of ICSBP are generated by transient transfection compared with LPS plus IFN-γ stimulation over the 24-h course of the experiment presented in Fig. 9⇑. Lastly, the C15 promoter is likely to be less sensitive to changes in ICSBP levels compared with native promoters because the C15 promoter contains only an IRF/Ets-responsive element and lacks additional LPS- and IFN-responsive regulatory elements that would be present in native promoters. Together, these results provide some of the first demonstrations that ICSBP is not a universal trans-repressor. Under conditions where MHC I gene expression is repressed by constitutive expression of ICSBP, ICSBP actually acted as a weak trans-activator in either the absence or the presence of IFN-γ. More recent studies suggest that this may also be the case for other macrophage genes. ICSBP has been found to stimulate transcription of the IL-12 p40 promoter via interaction with Ets-2 (K. Ozato, in preparation). In combination with PU.1 and IRF-1, ICSBP has been demonstrated to activate the gp91phox IRF/Ets composite element (41). The apparent ability of ICSBP to function as a dichotomous regulator of transcription is similar to the characteristics of other IRFs, including IRF-2, IRF-3, and IRF-4/Pip (Ref. 9 and references therein). At this juncture, the role of ICSBP in macrophage activation can be best assessed from studies using ICSBP knockout mice. The failure of macrophages obtained from these mice to control intracellular parasites is consistent with their failure to elicit the production of IL-12, and consequently IFN-γ (26). Specifically, macrophages from these ICSBP-deficient mice fail to express the p40 subunit of IL-12 (26). Together, these data suggest that ICSBP plays a critical role in the development of the fully activated macrophage. A role for ICSBP in the control of myeloid leukemias has also been proposed. Schmidt et al. recently reported a lack of ICSBP transcripts in human myeloid leukemias (50). This finding is consistent with an earlier report that ICSBP-deficient mice spontaneously develop a chronic myelogenous leukemia-like syndrome that is highly similar to the human disease (25). Our understanding of the contribution of ICSBP to both innate immunity and the development of myeloid leukemia will depend in part on defining the molecular basis for ICSBP gene expression and its capacity to serve as a positive and a negative regulator of IFN-responsive genes. ↵1 This work was supported by National Institutes of Health Grants AI18797 (to S.N.V.) and GM57053 (to M.J.F.). The opinions or assertions contained within are the private views of the authors and should not be construed as official or necessarily reflecting the views of the Uniformed Services University of the Health Sciences or the Department of Defense. Research was conducted according to the principles set forth in Guide for the Care and Use of Laboratory Animals, prepared by the Institute of Laboratory Animal Resources, National Research Council, DHEW Publication 85-23 (National Institutes of Health, Bethesda, MD). ↵2 W.K. and A.D.P contributed equally to the work presented in this report. ↵4 Abbreviations used in this paper: ICS, IFN consensus sequence; iNOS, inducible NO synthase; ISRE, IFN-stimulated response element; IRF, IFN regulatory factor; ISGF-3, IFN-stimulated gene factor-3; ICSBP, ICS binding protein; CAT, chloramphenicol acetyltransferase; IRE, IFN response element; pIRE, palindromic IRE. ↵5 Although originally referred to as pIRE and IRE-like motifs (38), the present nomenclature would be γ-activated sequence and ISRE-like motifs, respectively. Crawford, R. M., D. A. Leiby, S. J. Green, C. A. Nacy, A. Y. H. Fortier, M. S. Meltzer. 1994. Macrophage activation: a riddle of immunological resistance. B. S. Zwilling, and T. K. Eisenstein, eds. Macrophage-Pathogen Interactions 29-46. Marcel Dekker, New York. Paulnock, D. M.. 1994. The molecular biology of macrophage activation. B. S. Zwilling, and T. K. Eisenstein, eds. Macrophage-Pathogen Interactions 47-62. Marcel Dekker, New York.